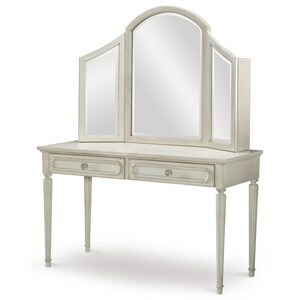 Prep like the stars with this old Hollywood inspired vanity and full length mirror. 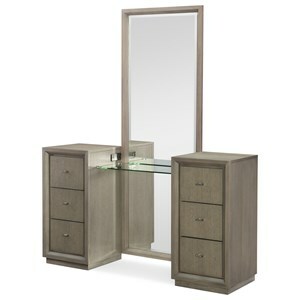 The vanity features a center glass shelf, two outlets with USB capability, six drawers with ring pulls and two sliding jewelry trays. The Cinema 6 Drawer Vanity with Full Length Mirror by Rachael Ray Home by Legacy Classic at Sadler's Home Furnishings in the Anchorage, Fairbanks, Sterling, Alaska area. Product availability may vary. Contact us for the most current availability on this product. 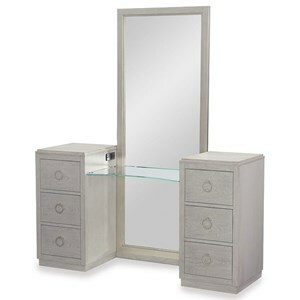 7200-0700 Vanity Mirror 1 28" 1" 72"
7200-7400 6 Drawer Vanity 1 60" 19" 33"
Finish Shadow Grey finish with select pieces available in a Silver Screen accent finish. Handles & Hardware Silver Screen (Silver leaf) Custom Know and Ring Pull Hardware. Case Detail Block feet, plinth bases, tapered legs. Browse other items in the Cinema collection from Sadler's Home Furnishings in the Anchorage, Fairbanks, Sterling, Alaska area.